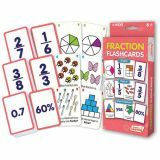 This value pack of flashcards includes 3 decks of 54 cards for teaching fractions. 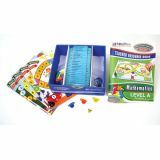 Covers geometric fractions, visual fractions and word problems. 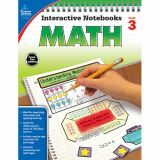 Includes visual examples to help children see mathematical relationships. Teaches fast, automatic recall. A perfect activity for independent or guided learning. 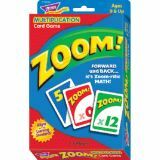 Contains: 3 flashcard decks, 162 cards in total. Cards also work with the Flashbot, sold separately. 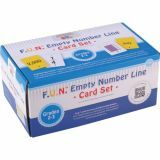 This set of 338 cards for grades 2-3 allows you to add cards to your F.U.N.™ Empty Number Line (sold separately) without having to purchase the hardware again. Great for math coaches and remedial teachers and others that teach across grade levels. Comprehensive coverage of the current NCTM standards! 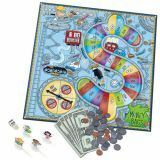 Game includes enough materials for 36 students–25 sets of 30 review cards; 12 double-sided, laminated game boards; and a 1-year online subscription. Grade 1. 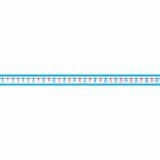 Skip Counting; Number Line; One Less, One More; Telling Time; Counting Coins; Addition Facts to 10; Simple Shapes; Patterns; and more! 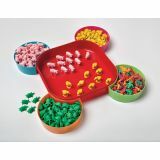 Hands-on helpers for patterning, sequencing, counting & more! 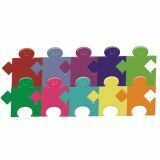 KidCounters™ are unique “kid-shaped” plastic blocks that are designed to connect horizontally and vertically. 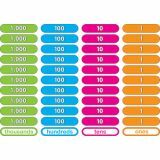 The set includes 100 KidCounters™ (10 each of 10 colors). The possibilities for sequencing, patterning, mirroring & counting are endless. 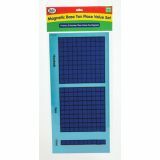 The 2” x 2“ size is easy-to-handle for little hands. 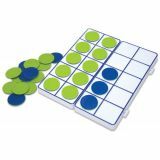 Complete with teacher's guide and 25 two-sided, full-color, 3.5” x 3.5”, self-checking, sequencing, patterning, mirroring and counting activity cards. The colorful box contains color-coded storage partitions to keep everything sorted and ready when not in use.